I have a process with long-running external backend tasks. My users want to see some feedback in the task list wich tells them about the progress in the backend. I can post progress information from the backend to the Camunda rest service and add that information to process variables. hoping that I can poll the Camunda backend from the browser to get the current process variables. Has anyone done a similar thing in the past? 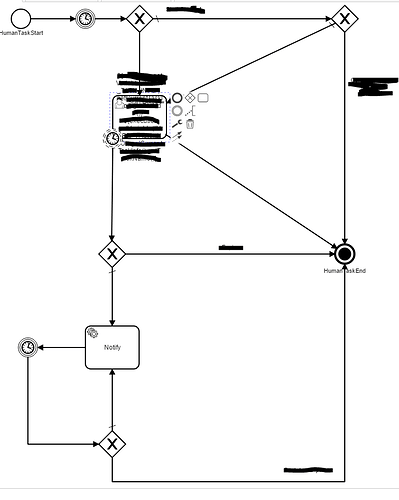 @dschulten… We have a similar use case where we have a log running process with multiple task. I had created a dash board to gather the stats from the backend and on the back end I have a user pattern that is created around user task that runs everyday morning to update the stats on a back end table (as well as send an email) that is used by the task board. the pattern looks something like this. First I thought I could simply ask the VariableManager to fetch the same variables again, but that did not work, an error message appears that the variable has already been fetched. // use injected $http service for making requests, e.g. There seems to be no form lifecycle event which tells me that the form is unloaded and I can stop the interval, or is there such an event? I totally circumvent the VariableManager - might be OK in this case, but the manager has no idea that variables have changed since the form was loaded.